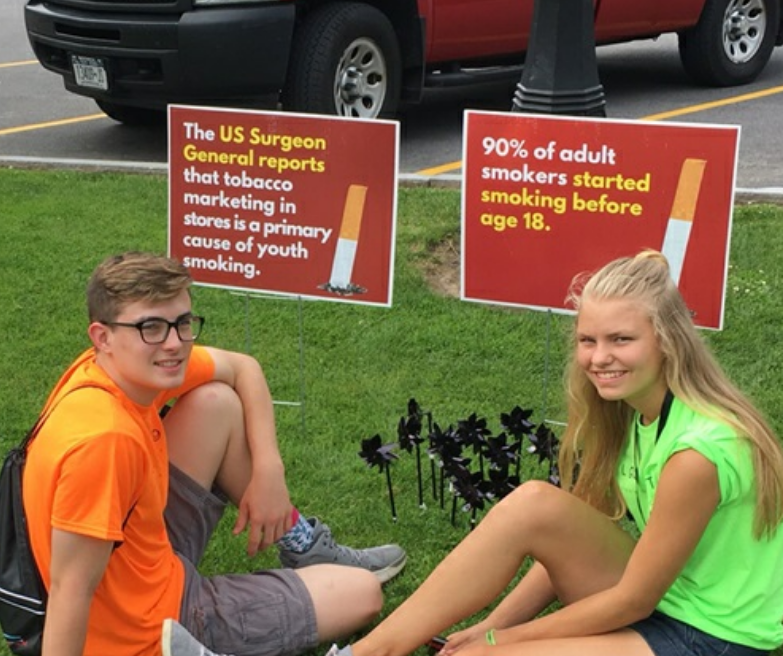 Some of the youth involved in Reality Check sit in front of signs and pinwheels that call attention to tobacco-use statistics. About 150 teens from across the state have just wrapped up an annual summit in Cazenovia that aimed to completely eliminate tobacco use among youth. The Reality Check event included a number of activities that highlighted tobacco use statistics. Cortland High School graduate Katie Couture says they have been working on leadership skills and helping their community learn the facts. Junior at Madison Central School in Madison County Brendan Hysell has been taking a stand against tobacco since he was 13. He says tobacco companies have a very specific target. 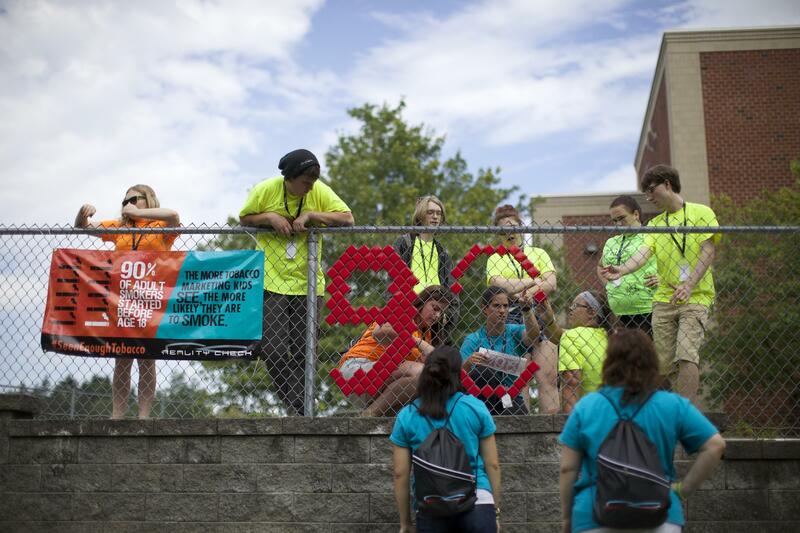 By inserting "Solo" cups in a chain link fence, youth crafted a powerful message demonstrating their opposition to tobacco use and tobacco marketing. Hysell says he got involved in Reality Check after watching loved ones bear the harmful effects of smoking. 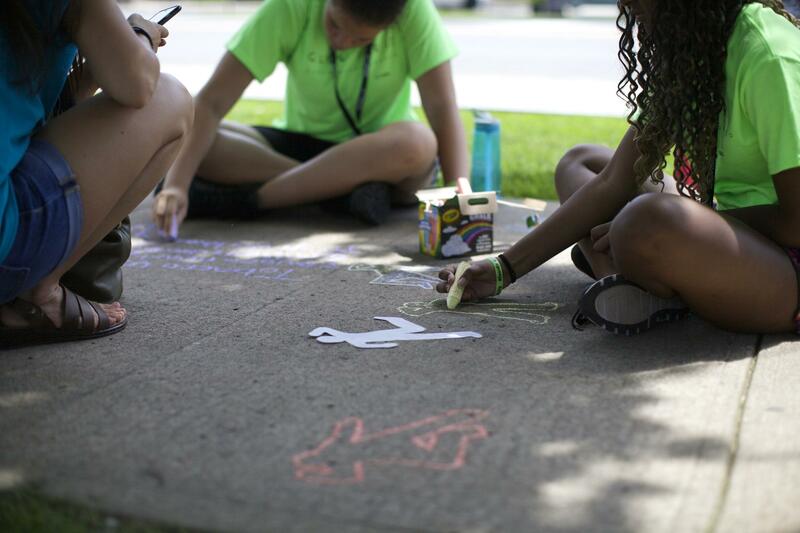 Youth used chalk to outline bodies and wrote facts and stats on the sidewalk to raise awareness about the tobacco industry's marketing and its effects on young people. Hysell says people his age smoke because they do not understand the seriousness or even consider the health risks. Katie Coture agrees. She says while the number of teens who smoke cigarettes has gone down, many have turned to vaping. She says some vape shops have opened in her town. Couture says despite the low number of teen smokers, the starting age for cigarette smoking is still as young as 13. She says she hopes to change this so her nieces and nephews won’t be subjected to tobacco advertisement or the false romance surrounding cigarette smoking. More information is at More information is at SeenEnoughTobacco.org. 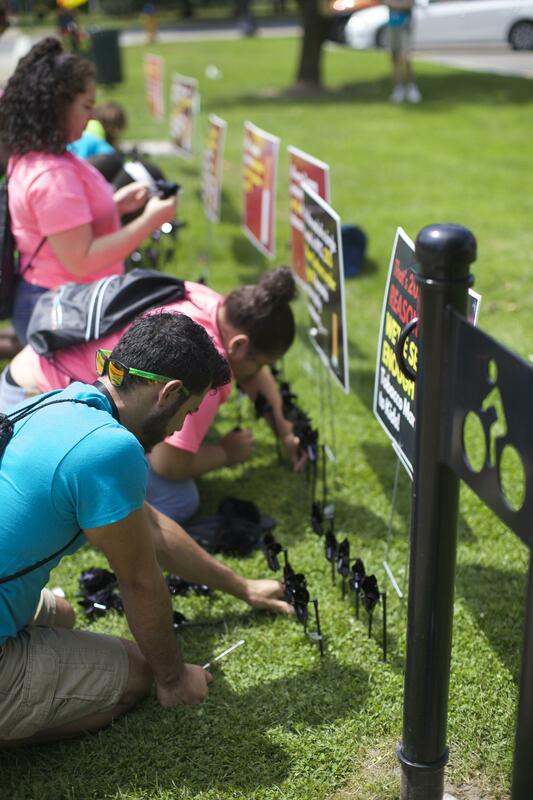 Youth placed colorful pinwheels in the ground reflecting startling tobacco use statistics. 230 pinwheels represented the number of teens who start smoking each week in New York. Onondaga County’s health commissioner and the American Cancer Society say a recent report issued by the U.S. Surgeon General confirms that more teens are using e-cigarettes and likely getting addicted to nicotine. Bill Sherman is Vice President of Government Relations with the cancer society out of Albany. He calls the report a watershed moment that indicates the potential harm of e-cigarettes. Should Legal Age to Buy Cigarettes be Raised to 21 in Onondaga County? There’s growing momentum behind a measure that would increase the age to buy tobacco products to 21 in Onondaga County. The legislation would target the 45 percent of tobacco users in Onondaga County who are between the ages of 18 and 24 in the hopes of curbing the addiction in that age group. Christopher Owens is the Director for the Center for Tobacco Health Systems at Saint Joseph’s Hospital, one of at least six members of a new workgroup pushing the measure. He says New York State is already hitting the issue from all sides.